Wolves were left ruing their luck after an own goal and a deflected strike consigned them to 2-0 defeat at Leicester City, who had Jamie Vardy sent off. The Premier League new boys looked in good shape to claim their first win of the season as they controlled the first half, hitting the post twice through Joao Moutinho and Raul Jimenez. But Matt Doherty headed into his own net to undo Wolves' early promise, before James Maddison's strike from the edge of the box found a way beyond Rui Patricio with a touch from Conor Coady. Vardy was shown the red card for a dangerous challenge on Doherty after 66 minutes, but Wolves were unable to make up ground in a second half of fewer clear-cut opportunities. Wolves made a bright start and had two chances to go in front inside the opening five minutes. Moutinho fired an effort against the crossbar after the ball was played back to him at the edge of the penalty area, before Doherty was denied from six yards by a Ben Chilwell block when he should have made Leicester pay. Leicester were left thanking the woodwork once more in the 21st minute, when Raul Jimenez pulled the trigger from 20 yards only to see the ball bounce wide off Kasper Schmeichel after rebounding off the left-hand upright. But, having fluffed his finish at one end earlier in the half, Doherty inadvertently sent a firm header beyond his own goalkeeper at the other after 29 minutes, misjudging a deflected Marc Albrighton cross. 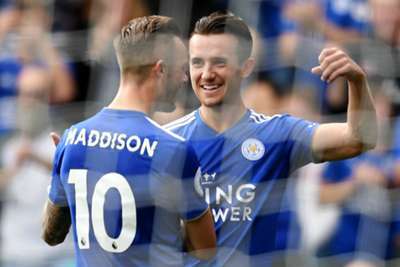 Maddison's effort, which found the bottom corner via a deflection off visiting skipper Coady, will have left Wolves wondering how they were 2-0 down at the end of a half they dominated for so long, and Vardy's dismissal did not prove to be the catalyst for a fightback. 3 - Since 2015/16, no player has picked up more red cards in the Premier League than Jamie Vardy (3, also Miguel Britos, Simon Francis, Sadio Mané and Victor Wanyama). Mist. Some optimistic Wolves fans have been tipping their side to finish well inside the top half this season, but they learned the hard way on Saturday that a failure to take your chances will be punished at this level. Had Moutinho, Doherty or Jimenez found the net with their early chances, this match might have played out very differently. Nampalys Mendy was an assured presence throughout in the heart of the Leicester midfield, distributing passes with impressive accuracy. Mendy also made a number of important tackles and interceptions as Leicester held on to an unlikely lead against their industrious visitors. A performance that helped the Foxes get over the finish line. Doherty will count himself lucky to have missed out on this unwanted accolade after his early miss and subsequent own goal, but he was less fortunate to find himself on the receiving end of Vardy's dangerous and frustrated lunge. Having lost possession, the England striker dived into a challenge that caught Doherty high and ended the Wolves defender's match. - Leicester have beaten Wolves in the top-flight for the first time since December 1983 (5-1 at Filbert Street), drawing once and losing twice also since then. - James Maddison has been directly involved in five goals in his last six home league games (3 goals, 2 assists), as many as in the previous 24. - Since returning to the Premier League in 2014/15, the Foxes have received 14 red cards, a haul inferior only to Newcastle in that period (15). If Wolves are going to chalk up their first win of the season in their next match, they will have to overcome the champions as Manchester City visit Molineux next Saturday. Leicester head to Claude Puel's former club Southampton on the same day.